STOP!!! This is the Wholesale Page for Books F-H. Minimum total Wholesale Order is $100.00*. Items may be mixed throughout the catalog. The $100.00 minimum does NOT include shipping and handling. Please stay on the wholesale pages when placing a wholesale order. Thanks! Plaiting, coiling, knotting, looping, and twining with fiber and metal to make woven jewelry. GREAT BOOK!!! Creative Jewelry Designs and Technniques. Several projects including: necklaces, earrings, barrettes, pins, & bracelets. Beautiful jewelry designs to weave and wear. 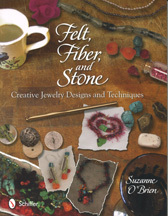 Many jewelry projects combining fiber & wire. History and pictures of California Indian baskets. 5 Distinctive Flowers Included in 9 Original Designs. Helen's Daffodil Hoop, Poinsettia Basket & Flower, Grandma's Mini Iris Basket & Flower, Pansies on Parade Basket & Flower, Golden Sunflower Basket & Flower. Technique of weaving diagonal double twill plaited baskets. 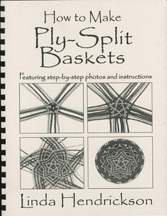 Patterns for 2 baskets. Tabletop book accompanies an exhibition of the same name produced by the Museum for African Art in New York. Using an assortment of colorful, sparkling beads as decorative embellishments, you can make necklaces, earrings, napkin rings, lampshades, hat bands, and more for everyone you care about. Projects and techniques using braided, twisted, and knitted wire. 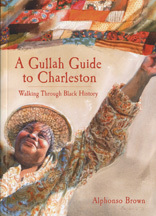 Travel guide book with 3 walking tours, and 1 driving tour of Charleston, SC. Visit Gullah historical sites, including the market where sweetgrass baskets are sold, today. Written in English & French. 51 pages. Mostly color photos. 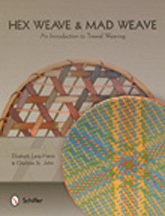 Through more than 200 diagrams and photos, you will learn the basics of the two simplest forms of triaxial weaving - hex weave and mad weave. Practice your new skills with 13 projects. Patterns call for paper, ribbons, and yardage. "Author Cathy Jakicic pulls together some of her favorite things - beading, scrapbooking, and a life filled with adventures and mementos - and shows you how to transform them into necklaces, earring, bracelets, rings, and other accessories." Includes the basic steps of hitching, 6 row diamond which patterns are based on, traditional knots for covering joints, dyeing horsehair, creating patterns, & much more. Advanced patterns and inlay projects. "Details the beautiful styles and designs of woven plaques and baskets made by Hopi women artists of Third Mesa in Az. Featuring step-by-step photos & instructions. 12 projects. 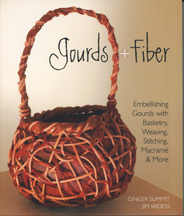 Includes: introduction, tools & techniques, terminology. 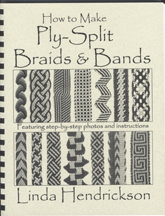 Detailed instructions for making a variety of ply-split braids & bands. Richly illustrated.